On the surface iMovie '09 doesn't appear that much different than the iMovie '08 everyone complained about. But when you start digging through the software, you realize Apple actually listened to all the user complaints. Let's face it, iMovie '08 was a step backwards for the iMovie software, so much so that Apple even made it a point to keep iMovie '06 available as a download well after the software had been updated. The biggest complaint with iMovie '08 was it lacked all the special features found in the previous version that made video editing so fun and easy. 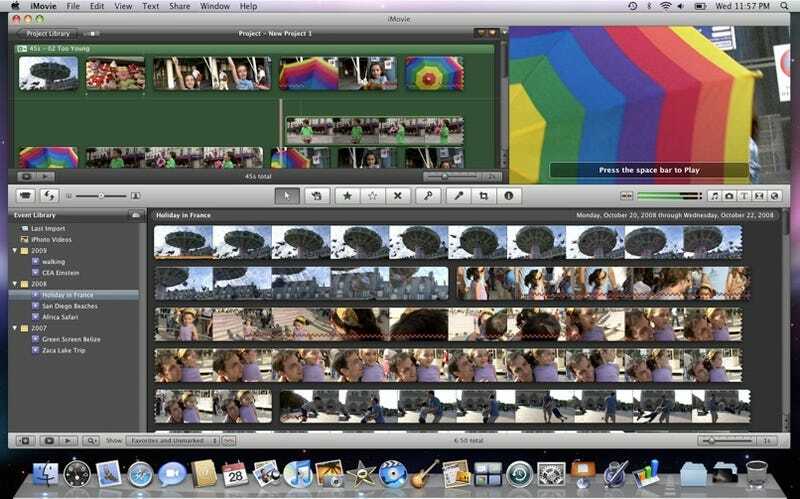 iMovie '09 has regained most of the features that were lost in the '08 version and even has some new ones like video stabilization, green screen and animated maps. The UI still lacks a dedicated timeline that most video editors are accustomed to using, but to make up for it iMovie '09 has new tools like the precision editor and advanced drag-and-drop capabilities. Apple's response to all the complaints about iMovie '08 lacking a timeline is this new precision editor window. Once you're in a project, you select precision editor in a clips pop-up window, and the bottom half of iMovie becomes the editor. This tool is intended to help make more precise edits between two clips in your project, and does this by showing the two clips in an overlapping fashion. You simply click the spot in a clip you want to cut at and than iMovie automatically moves the clip to create the cut you want. The window can also display audio tracks, effects and titles along side the video clips so it feels more like a timeline than a simple project window. There is also the option to move titles and change audio tracks of clips. The problem here is that the precision editor won't let you do precise manipulation of a music track. This is frustrating, especially when you're trying to line your video up with music. For the simple trimming of clips precision editor works pretty well—better that than nothing—but it's still no substitute for a timeline. After checking Show Advanced Tools under iMovie Preferences, this drag-and-drop tool shows much more features. In iMovie '08 dropping a clip from the library on-top of a clip in the project window simply inserts the library clip into the project. Now in iMovie '09 the same action brings up a pop-up menu filled with choices. It has options to replace the clip four different ways into your project or just to insert it the same way it would have in iMovie '08. The best features though are the Audio Only, Cutaway, Picture-in-Picture and Green Screen—all of which are completely new to iMovie '09. For the common shaky video clip using video stabilization will impressively make the annoying camera movement disappear. iMovie '09 does this stabilization in two steps. First it will analyze the video clip frame by frame and pixel by pixel, comparing one side of the frame to the other. Once it has analyzed the clip it applies a function that scales, rotates and moves the video based on the comparison. It zooms and trims the clip as much as it needs to apply the reverse movement of the camera shake and still not go outside the video frame. What's more interesting is this video stabilization is the same effect Apple uses in their professional visual effects program Shake. Thank God or maybe Jobs, but video effects like speed, reverse play, and color adjustments are all back in iMovie '09. The clip inspector window now has options for all these effects. There might not be as many effects as there were in iMovie '06 but there are some new ones, like the cool Sci-Fi and Heat Wave color shifts. Themes have also returned to iMovie. There are six different themes to choose from and each one puts a visual effect on the first and last clip in the project. The first will show an intro title like a scrap book with video playing on it and at the end it will insert a directed by title over your last clip. What's cool is it will also add theme-related transitions to the transitions selection. Same goes for the titles. You only get about four new transitions and titles, but it's nice to keep each element of the project in theme. iMovie '08 only had 12 titles to choose from which was pretty pathetic, but now iMovie '09 has over 32. The titles aren't as customizable as they were in iMovie '06 but with new additions like Clouds and Organic Main it might make up for it. As for transitions, only a few new ones have been added but nothing spectacular. The maps visual affects are pretty cool but not something that can be used with every project. There's eight different moving maps to choose from—not just fake Indiana Jones maps but real ones that you can put your real locations on, as well as set your desired duration. When changing the destination points on a map, it conveniently pulls up a search window for city or airport, which makes finding a specific location very simple. After playing with these maps, I can say the best feature is the ability to add video effects. Since you can add the same effects to maps that you can to video clips, you can make Sci-Fi-looking worlds, like I did in the the video above. It's very sad that a background selection was not available in iMovie '08. Something so simple like a background is really essential to giving users the freedom to create any type of project they want. With an assortment of solid colored and moving backgrounds, iMovie '09 now has the the option to a add a simple color frame to the project. I for one am glad backgrounds are finally back. This is another new feature in iMovie '09 that is intended to assist at editing to music or making a music video. What this option does is allow the user to drop beat markers on a music track and then using those beat markers iMovie '09 will adjust the video clip durations to match the markers. This option will take some getting used but it seems like a valiant effort on Apple's part to create something useful. After playing around with the edit to music and green screen options I was able to create a fun little video. Before you start asking who the hell these kids are, all the sample video clips I used were provided by Apple so ask them.